One lane of the many-laned viaduct is closed each way. Within the tunnel itself, all lanes are open. 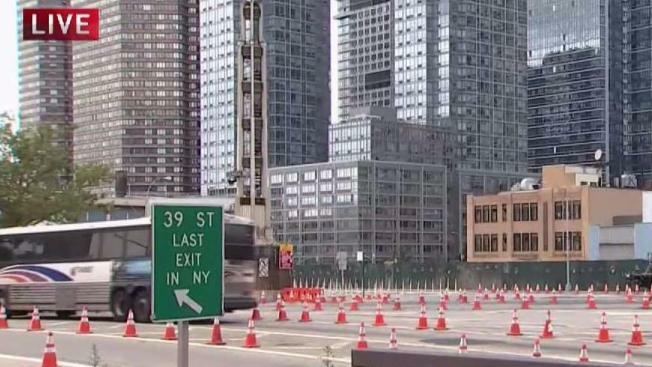 The first day of a long-term road project expected to bring epic traffic jams for commuters to and from New York failed to live up to the hype Monday, giving them at least some hope that the predictions of "carmageddon" were overstated. Cars streamed along Route 495 toward the Lincoln Tunnel on Monday morning and back out in the afternoon on the first full day of lane closures to accommodate the rebuilding and resurfacing of the 80-year-old viaduct connecting the New Jersey Turnpike to the tunnel. Just outside the tunnel in Union City, site of many a shortcut via GPS apps, extra police were deployed to oversee busy intersections. But the traffic was orderly, almost calm, in the morning as commuters hurried to catch shuttle buses into the city. Roughly 150,000 vehicles drive across the span each day, making it one of the Northeast's worst bottlenecks when there is an accident or emergency road repair. For the viaduct project, one lane each way will be closed for the next 2½ years, 24 hours per day. The viaduct is considered functionally obsolete and structurally deficient. Motorists have been urged to take public transportation such as trains or ferries, stagger their travel times or use other routes into the city such as the Holland Tunnel in Jersey City. While Monday morning was a bright spot, a truer test may come in two weeks when summer vacation season ends. "It is very important for commuters to remember that just because traffic was light today, they should not be lulled into a false sense of security," New Jersey Department of Transportation spokesman Steve Schapiro said in an email. "Traffic may be heavy over the next several weeks, particularly after Labor Day when people are back from vacation and school is back in session. Commuters should continue to seek alternative routes over the course of the project." For one day at least, the traffic predictions around Route 495 project echoed those from 2014 when the resurfacing of the deck of the Pulaski Skyway through Jersey City to the Holland Tunnel began. The predicted apocalypse failed to materialize as commuters adjusted their routines, and the resurfacing was completed this year. New Jersey DOT Commissioner Diane Gutierrez-Scaccetti said last week the Route 495 project "will result in a tremendous amount of pain for everyone who lives and travels in this corridor." But commuters opting to ride the rails will find a system plagued by dozens of cancellations in recent weeks, many with little or no advance warning, due to an engineer shortage at New Jersey Transit exacerbated by required track safety work. The cancellations are expected to continue, albeit in smaller numbers, until the end of the year. 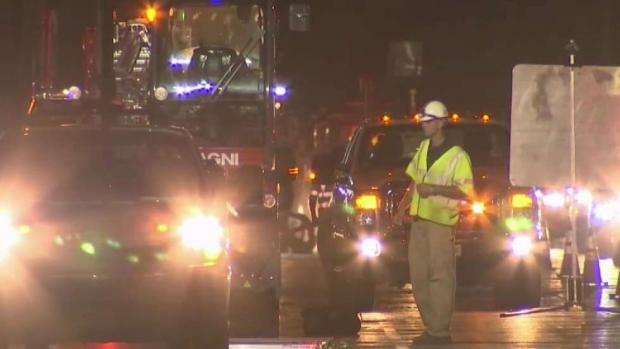 Motorists will also have another major disruption to contend with the year after the Route 495 work is completed: the replacement of the helix leading down into the Lincoln Tunnel, tentatively scheduled to begin 2022 and last about five years.